We recently got our rolling pins out again in the Holmes Media office to host another Macmillan Coffee Morning all in the name of raising money for Macmillan Cancer Support. Last year, Macmillan Coffee Mornings raised £27 million to support people with cancer through specialist health care, financial support and counselling. This year, they’re aiming to raise even more, so we donned our pinnies for another year and got baking to help them get there. We were so impressed by some of the baked goods that it was hard to believe they were actually homemade (they were, we checked). As part of our baking competition, only one could be the winner though and that went to the delicious lemon drizzle made by Ashley in the Sales team. Sorry, we had the last slice. 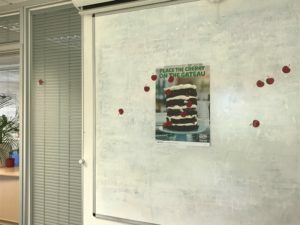 There were all sorts of activities going on during the day to help us raise money, including a ‘Guess the Length of the Vegetable Slice’ sweepstake and a game of ‘Pin the Cherry on the Gateaux’, which is like a tastier version of ‘Pin the Tail on the Donkey’. Thanks to the generosity of all the staff here at Holmes Media, we were able to raise £59.75 which was then very kindly matched by the company to give us a grand total of £119.50. We can’t wait to do it all again next year! Anyone can host a Macmillan Coffee Morning so why not visit the Macmillan website to arrange your own and help raise even more money to support this great cause.